Even the world's leading press often publish articles that, to me, are difficult to accept. This month I saw two instances of that, and the perpetrators were the world-renowned Wall Street Journal (WSJ) and Time. Of course, these papers often carried this type of articles previously. On the 8th, right after Bill Clinton visited Pyongyang and brought back the reporters, WSJ published an article that spoke of Kim Jong-Il's "kitsch" taste in art. [TK Note: here is the WSJ article.] 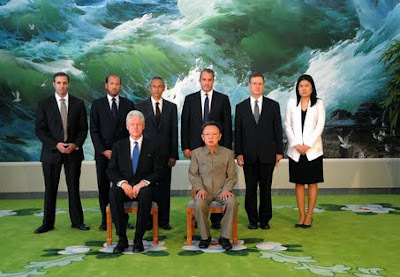 The article says the picture of large waves in the VIP room in Baekhwawon shows Kim's kitsch taste in art. This is the painting in question. The article says the waves symbolizes the power of the dictator and the bird over the sea is remiscent of a natural paradise. Riiight. I felt it was absurd to interpret a seagull flying over a storm as a symbol for paradise. That painting is known to be the work by Kim Seong-Geun, the people's artist in North Korea who specializes in painting waves. The title of that painting is "Waves of Chongseokjeong", and other renowned works of Kim include "Waves of Haegeumgang" and "Waves of Haechilbo". I do not have much knowledge in fine arts, but paintings of that type would fall under the realism movement. But WSJ dared to call that painting kitsch. That angered me, because it felt like I became a kitsch person as well -- because I also have a painting of scenary that has a beach with waves hanging in my home. I look at that painting and think about my hometown near the sea. Is my taste kitsch too? Painter Kim also won an award at International H2O Color Competition in Rome -- the judges of that competition must have been kitsch too. I also have something that I have a hard time understanding. Several years ago in America, I recall a so-called "painting" that had a dot on a white sheet of paper being sold for tens of millions of dollars at an auction. I could not understand why that painting was so expensive, but the true masterpiece was the explanation: "Do you know how feverishly the painter agonized to find the right place to put that dot on the paper?" I don't know if the painter truly agonized, but to me the painting would not change at all whether or not the painter agonized or not. I wonder if WSJ views this type of "painting" as an example of elegant taste. No matter how much one hates Kim Jong-Il, this isn't right. If WSJ satirized Hu Jintao that way, there would be a strong, immediate reaction: "Arrogance based on imperialistic ideas," "extension of white supermacist racism", etc. I also hate Kim Jong-Il, but I do not wish to see that type of article again. Another is an article on Time magazine on the 14th. This weekly news magazine selected the ten worst dressers among world leaders. 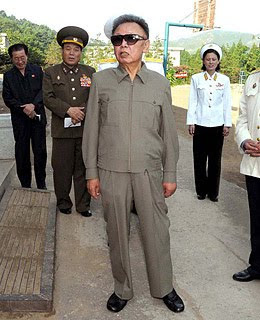 [TK note: article here] As expected, the number one worst dresser is Kim Jong-Il. The magazine assessed that the same khaki suit, large sunglasses and five-inch platform shoes to make the wearer appear taller is unusually out of style. The magazine also adds: "[H]is ill-fitting suits ... did little to conceal Kim's paunch." Pretty much the same as the list of world leaders that America hates. They are all either anti-American leftist leaders or dictators. Fine, I understand hating them -- but faulting them on their dress is truly low, not becoming of Time magazine's prestige. Kim Jong-Il's garb is, for him, a product of his agonizing thoughts. The jacket may not cover up much of the paunch, but everyone knows a suit would make the paunch look even more prominent. I would like to see Time selecting the best dressers among political leaders. The leaders of capitalist countries like America, Britain and Japan always wear a suit -- it makes news when sometimes, they go without a tie and undo the top button on their shirt. I doubt Time would select that to be the best fashion sense. The reason why I mention this is because if I had to choose one post in my blog to be translated and circulated in American websites, this one is it. If media wishes to criticize Kim Jong-Il, they must do so in a straightforward manner; this type of low blow would only generate negative reaction, leading to more loss than gain. At any rate, how would Kim Jong-Il look if he wore a suit and a tie, without his platform shoes? Just thinking about it makes me laugh. That would really make him the worst dresser. Count me as another huge fan!!! Man, I hate to get all mawkish sitting here in the US of A all comfortable but the recent post about the little girl was an absolute killer. Just about killed me inside. American magazines and newspapers over-analyze everyone's fashion. When Clinton was running for president the first time, Hillary was mercilessly mocked at first for being dowdy and then for improving her hairstyle, and when Gore was running, they made fun of the fact that he wore brown suits. The news organizations detailed the brand names of everything Palin wore and then criticized her for the money it took to maintain her style. Way too many articles were written about how buff Michelle Obama's arms are. Is Mr. Joo aware of how big a deal the American news organization made out of these "issues?" Relative to some of those stories, this treatment of world leader fashion is relatively light-hearted and tame. I doubt that the Time specifically picked on leftist leaders or dictators. "Fashion" is nothing but cultural consensus, and the leaders who will be most out of "fashion" will be those who are out of or who actively reject the Western cultural consensus. If you only look at leaders who dress badly, you will thus see the ones who reject the Western cultural consensus, who are all currently leftists or dictators. The Time editors are guilty of being unable to connect the dots like I just did, but I doubt they were trying to make an overt political statement. I remember discussing Kim Jong Il in my government class in high school and objecting to a similar article, which focused on his love for James Bond movies or something like that. I was the only one in the class who felt like there was something wrong with the article, which just seemed out to make him seem crazy and eccentric in his personal life - basically demonizing him as if preparing him to be our enemy (this was right after the Iraq war started). The teacher saw my point and tried to get it across, but the vocal members of the class basically insisted that Kim Jong Il was a crazy dictator and were not receptive to the point at all. This was the only time I remember becoming conscious of the fact that I was the only one in that class with a Korean background (or with any sort of Asian background at all). Which was strange since the point wasn't about race, but about the article's focusing on something trivial to make Kim Jong Il look ridiculous. It would have been different if they focused on actual criticisms of his government or policies. I'm glad someone is speaking out against this sort of thing. What about the way Bush was regularly handled by the foreign press - he walks in a stupid way, he has a dumb accent, he looks like a chimp, he wore a flight suit... I could go on. Really though, you're missing the context, people aren't laughing at Kim because he likes movies, that would be puerile. Why would it ever matter what someone's taste in movies is? Well actually, it does have weight in this case. An absolute dictator of a country who openly spouts a virulently anti-American propaganda line who likes James Bond movies. That is absurd! It's totally inconsistent with the man his own media portrays him as being. A short man? No, he isn't being dumped on for being short. That would be immature. But a short man who wears platform shoes - that indicates he feels some inadequacy. A fat pudgy man in a nation which is suffering starvation induced by Kim's policies? Again. That's ironic and funny and a great criticism, he's obviously greedy and self centered. An absolute dictator who enjoys a very luxurious lifestyle but wears a cheap looking military suit? By our standards that's funny. Now, on this final point I will grant you it's a poor criticism. It would be worse if he spent more money on clothes for himself. On the art, even if you personally like it, once any art style is officially endorsed by an authoritarian government it becomes kitsch. If a lone painter working through his personal demons decides to paint humble farmers and factory workers in a realistic manner, that's unique. When the Soviets endorse it and enforce specific themes and ideals it becomes socialist realism and kitsch. That's just how the art world works. Another good example of this is Rothko, who basically just made solid color paintings. If Kim Jong Il told people to start doing this, it would be the height of Kitsch. But Rothko doing it as an expression of his own deep ideas and being the first to do it made it art. There's no scientific standard to art.